Our youngest patients come in to look over our gadgets and play with the chair (to them it's a space ship) at two and a half years of age. By the time they're three they thoroughly enjoy coming to visit us; there are not many places where they have so much fun and receive so much attention. And at the same time we check their teeth! Prevention is always better then cure; fluoride, and the fissure sealants we now use, ensure that fillings are almost never needed. But if they are, tiny white fillings set by magic lights are a fascinating experience. 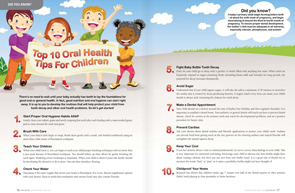 Children's teethWhen should I take my child to the dentist? When will my child's teeth come through? 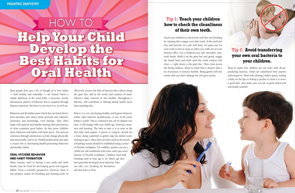 The first permanent 'adult' molars (back teeth) will appear at about 6 years of age, behind the baby teeth and before the first teeth start to fall out at about 6 to 7. The permanent 'adult' teeth will then replace the 'baby' teeth. It is usually the lower front teeth that are lost first, followed by the upper front teeth shortly after. All permanent teeth should be in place by the age of 13, except the wisdom teeth. These may erupt any time between 18 and 25 years of age. When the first teeth start to come through, try using a children's toothbrush with a small smear of toothpaste. There are many different types of children's toothbrushes available, including brightly coloured brushes, some of which change colour, those with favourite characters on the handles, and some with timers. These all encourage children to brush their teeth. The most important point is to use a small-headed toothbrush with soft, nylon bristles, suitable for the age of your child. Children can sense fear in their parents, so it is important not to let your child feel that a visit to the dentist is something to be worried about. 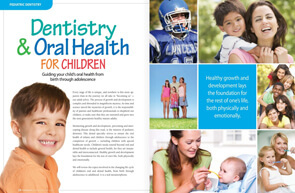 Try to be supportive if your child needs to have any dental treatment. 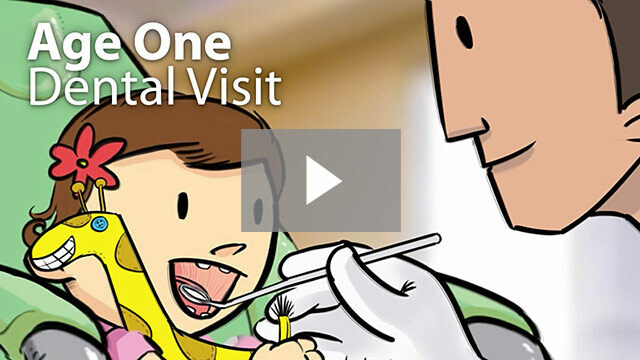 If you have any fears of your own about going to the dentist, dont discuss them in front of your child.